BANGI, 28 Jan. 2012 – The UKM Royal Concert 2012 held to celebrate the 64th birthday of the Chancellor of The National University of Malaysia, Tuanku Muhriz Ibni Almarhum Tuanku Munawir at the Tun Abdul Razak Hall (Dectar) in the campus here tonight was enthralling and most captivating. At the function, besides a cake cutting ceremony, Tuanku Muhriz who is also the Yang di-Pertuan Besar of Negeri Sembilan Darul Khusus, was presented with an Ibanez guitar as a birthday present. 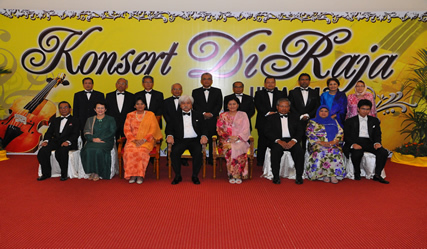 The Tengku Ampuan Besar Tuanku Aishah Rohani binti Almahrum Tengku Besar Mahmud was also in attendance besides UKM’s Pro-Chancellor, Tunku Intan Safinaz binti Tuanku Abdul Halim Mua’dzam Shah. Vice-Chancellor, Prof Tan Sri Dato’ Wira Dr Sharifah Hapsah Syed Hasan Shahabudin in her welcoming speech read a seloka (poem) and a pantun. In part she said the Beatles once sang “Will you still need me when I’m 64? The UKM workforce will always be loyal, she said. The capacity crowd was enthralled right through the almost two hours of music and songs by the UKM’s Orchestra conducted by renowned national music virtuoso, Dato’ Dr Johari Salleh and its conductor, Mohamad Adzan Mohamad Fadzil. Tuanku Muhriz’s son, Tunku Zain Al-‘Abdin and Tengku Sarah Rahayu binti Tengku Baharuddin also gave their renditions on the piano. The audience was also entertained by popular singer Najib Hanif, the ‘Tom Jones of Malaysia’ in the 70s who sang Tom Jones’ songs “Help Yourself” and “Delilah” and another song “Biar Bulan Bicara” (Let the Moon Talk). Another popular singer Dayang Nurfaizah captivated the audience with her four songs. UKM students Mohd Iskandar Zulkifli, Nik Husna Nik Ali and Nur Ilham Rameli also rose to the occasion with their performences. Other groups which captivated the audience includes ARTISUKMA UKM dance troupe, Trio PERMATApintar and Trio Perkasa Remaja. Five instrumentals by UKM’s Orchestra rendering the late Tan Sri P Ramlee’s songs and a Gamelan presentation culminated the night making it a most memorable evening for the audience. This was followed by the Royal Supper.